Donald Trump has pissed off the reporting pool in hilarious fashion by ditching them Tuesday night for a steak dinner with his fam. 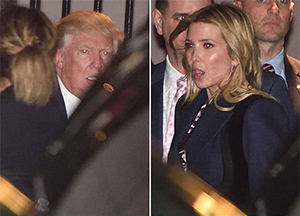 Trump and his team told reporters he was done for the night, but a number of reporters were infuriated to find out later in the evening he left Trump Tower with Melania, Ivanka, Jared Kushner, Donald Jr. and Eric for the 21 Club. In the world of steak dinners, that’s the unkindest cut of all.